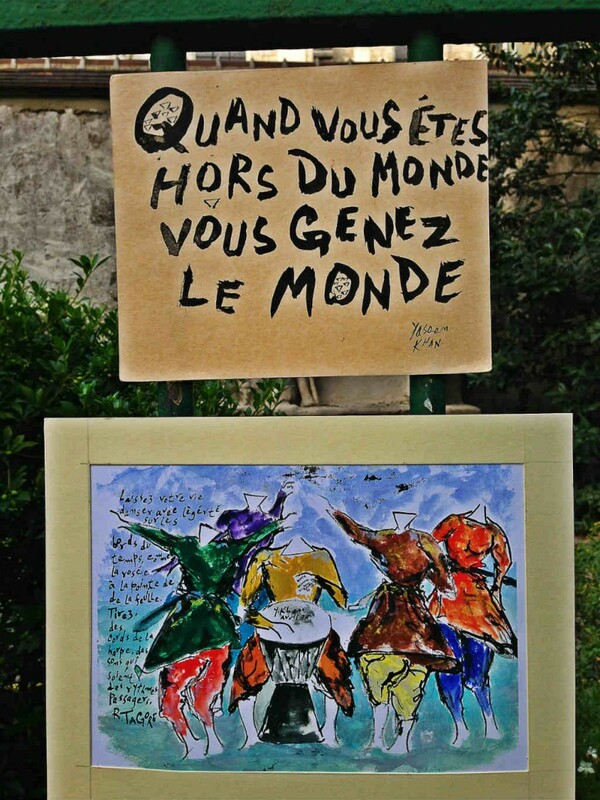 Outside the Church of Saint-Germain-des-Prés in the Left Bank of Paris, it is difficult to pass by and not notice the work of India-born artist Yaseen Khan whose paintings and quotes evoke questions about the meaning of life. Yaseen Khan's outdoor gallery, a vision of beauty and grace, is like a mirror encouraging a closer self-examination of our true being. I feel inspired by a few verses and start working on the canvas. So, in that sense, it is just a reflection of my state of mind and the verses in the poems. Poetry is not mathematics. It has to be felt from the heart. If you walk past the Church of Saint-Germain-des-Prés in the 6th arrondissement of Paris, an area known for its bohemian and intellectual roots, chances are you will notice the outdoor art ‘gallery’ of Yaseen Khan. If you linger long enough to gaze at Monsieur Khan’s paintings interspersed with thought-provoking poems which grace the wrought iron fence of the church, you might catch an elegant and mysterious figure dressed in white a few feet away. In this artwork you will notice his signature open triangle heads, accompanied by words, sometimes his and sometimes borrowed, that get to the meaning of life very quickly. If you build up the courage to speak to the reclusive artist, you might discover how a Delhi-born Indian came to live a creative existence in Paris. Yaseen Khan draws many looks here in the fashionable Left Bank and most Parisians are not sure what to make of him. It is his simplicity that is most alluring as his tall, lanky frame carries his loose-fitting clothes with the finesse of a French gentleman. A hat, scarf, and the only piece of technology he owns, an old film camera hanging around his neck, complete the look. 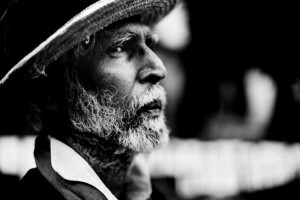 He is melancholic when he speaks, alternating between English, French and Hindi like a fluid brush stroke. The 70-year old artist, having spent nearly the last 37 years in Paris, admits he never expected being mistaken for a tourist and complimented on his Hindi in his motherland — a common predicament amongst those who straddle two countries, two cultures at once. Yet, he belongs to Paris as much as Paris belongs to him. He has participated in several collaborative exhibitions, starred in a few French films with his latest being The Untouchable which premiered at the Venice Film Festival in 2007, and dabbled in some modeling. Even the Mayor of Paris wrote a letter indicating appreciation of Yaseen’s work. Quand vous êtes hors du monde, vous genez le monde. This is exactly what Yaseen strives to do as he stands alone observing the world pass by. Leading a life that is devoted solely to his art, he wants to create a disturbance within himself and others that is akin to an earthquake shaking up the heart and mind to such a forceful degree that they are never quite the same. Life to him is poetry. He is at the church every day, and occasionally finds beauty when he connects with those who are touched by his work. He considers this to be the the biggest reward, not the material life which he has shunned. In fact, he is far removed from the external world, not knowing how mobile phones or the internet work. Someone—perhaps a fan—insisted on setting up his website, which Yaseen hasn’t yet seen nor cares to. He explains that his paintings—produced in gouache, watercolour and Chinese ink to give the unique effect of an oil painting—arise from feelings within the depths of his soul. He equates the finished product as a song, heard at the end of his fingers, making music far beyond his own imagination. “You can feel the breath which vibrates at the end of the hand and this is no longer the brush that touches the canvas, but the soul itself which springs from the envelope of the body…the silhouette of a soul is emerging as a flower thanks to its essence out of his depth,” he elaborates. 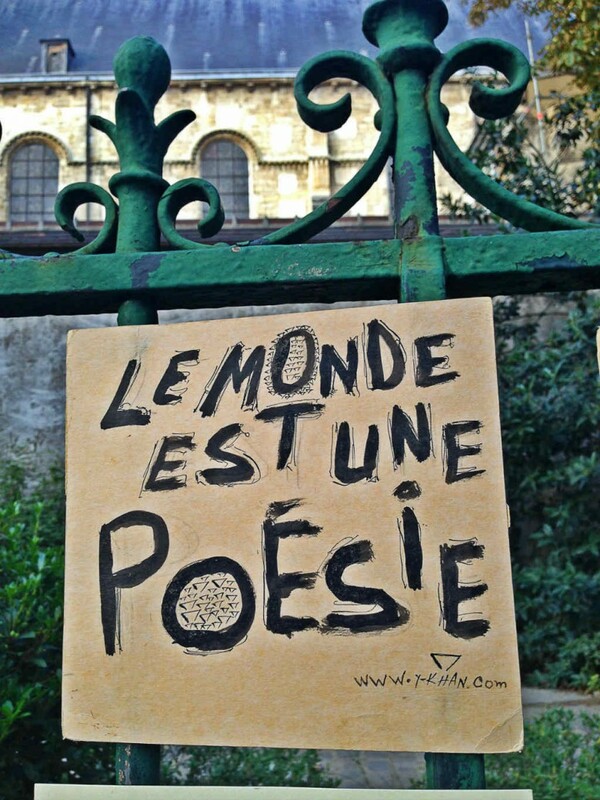 Le monde est une poésie. 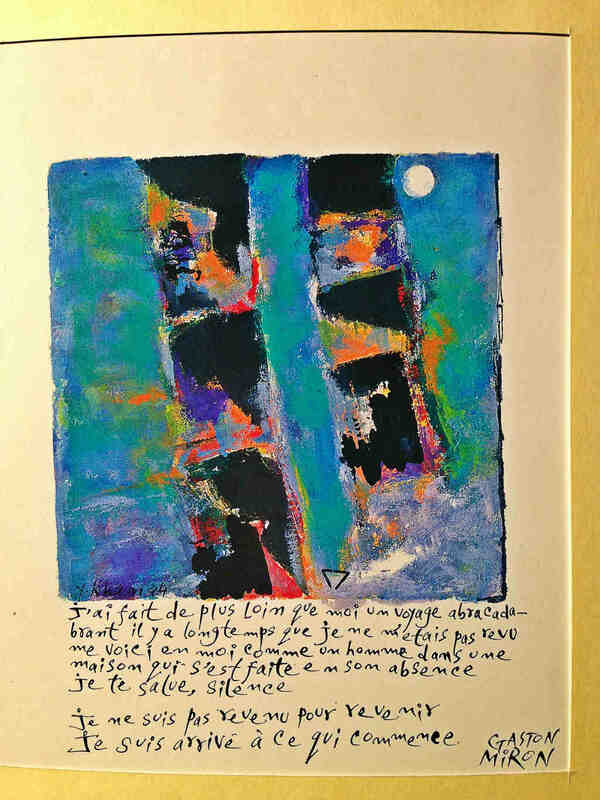 To Yaseen, the world is poetry so the verses on the paintings are inspired by noted French poets like Fernando Pessoa, Paul Verlaine, and Guillaume, as well as India’s own Nobel laureate, Rabindranath Tagore, whose work he’s read in French. He writes these verses with some zigzag movement to encourage passersby to linger on the words and contemplate. And they do, although having made little sense of the mysterious Monsieur Khan himself.